A while back, I received some products from Cocoon Apothecary, a Canadian artisanal skincare company that specializes in eco-friendly beauty products. As you all know, I love supporting local companies and even better when it's one that has such a great brand philosophy: to make skin and body care products that are as good for your skin as they are for the Earth. I have been putting these products to the test for the past month and am now ready to share my thoughts. Good news: no breakouts whatsoever (this is a typical concern of mine when trying out new skincare). The Rose Dew Facial Toner ($20 CAD) is an alcohol-free toner made with certified organic hydrosols of rose and witch hazel. It feels very refreshing on the face and although I'm not a huge fan of florals, the rose scent is light and not too cloying. My favourite product, the Rosey Cheeks Facial Cream ($40 CAD), is intended for normal to dry skin. Though my skin typically leans oily/combination, it has been working well for me now that the weather is cooler and my skin needs more hydration. The cream feels rich but not thick or greasy and it absorbs quickly. The rose scent is similar to the Rose Dew Facial Toner. 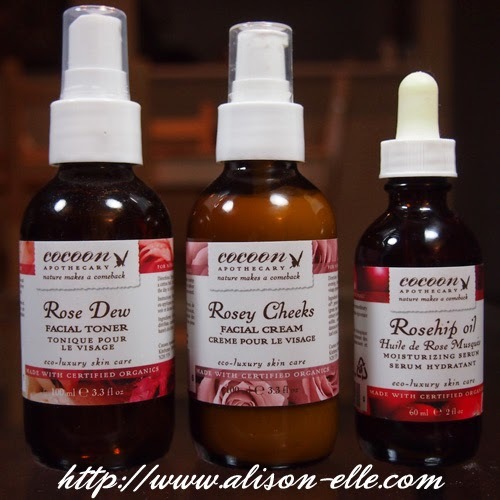 For those with extra dry skin, Cocoon Apothecary recommends adding a few drops of Organic Rosehip Oil Facial Serum ($24 CAD) to the facial cream (or it can be applied directly to the skin). The serum is made with a pure organic oil that has been cold-pressed from rosebuds that have swelled with seed. Clinical studies have proven this oil to be effective for sun damage, scars, and fine lines. Seems like a miracle product but unfortunately I can't get past the smell... it's hard to describe but it does not smell good to me. 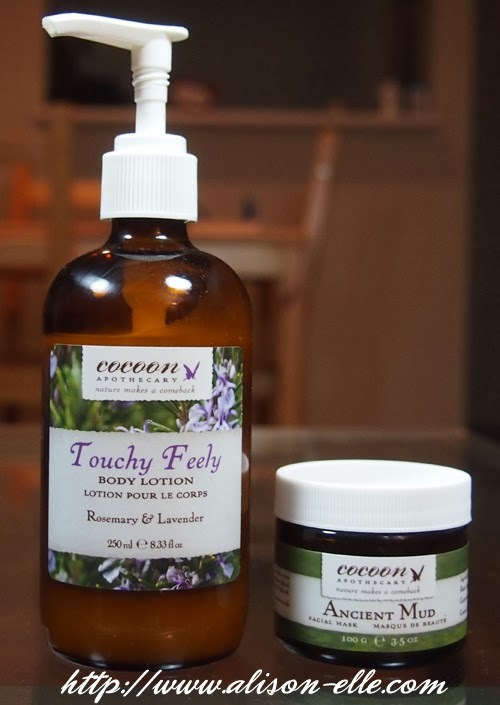 Touchy Feely Body Lotion ($21 CAD) is unlike any other body lotion I've ever used. It's made with organic olive oil, a natural moisturizer, though I find that this means it takes a while to fully absorb into the skin. I do love the rosemary and lavender essential oils, however, which make for a very relaxing scent especially when I'm feeling stressed. The Ancient Mud Facial Mask ($24 CAD) is also a real treat as there is nothing I enjoy more than a good face mask. This one is made with dead sea mud to re-mineralize and purify the skin, glacial marine clay to draw out toxins and exfoliate, and neroli & rose essential oils to nourish the skin. All in all, I have been really impressed with Cocoon Apothecary and I love the fact that all of the products are non-toxic, natural, and free of petroleum and parabens. Plus, check out that beautiful packaging! The amber glass bottles are 100% recyclable; the labels are even plant-based. Find Cocoon Apothecary online or and certin natural health retailers. These look beautiful - any idea if they ship to the US? Great review on these products btw! This stuff sounds so cool! I'll have to check it out! Ooooh, amber glass bottles? I love it when the bottles are actual glass! This sounds like a lovely company that I will have to check out! Me too. Feels so weighty!